They risked their lives and gave their time and service to our great nation. They sacrificed so much of themselves. These are the veterans of the military of the United States. For many members of the military, they retire from their time serves with haunting memories they would rather not have. Many of them are plagued with mental health disorders such as post-traumatic stress disorder or PTSD. For many veterans, substance abuse is also a real issue. While the entire country is facing the plague of substance abuse, this is especially true for the veteran population. Unfortunately, drug and alcohol use is all too prevalent for veterans. Why do veterans suffer with alcohol and drug addiction? For some veterans, they have difficulty transitioning back to civilian life. Others have many mental and emotional struggles. Chronic pain is a problem for many others. It isn’t easy to understand the complex combination of emotions that overtake veterans when they return from military service. It can be extremely difficult to transition back into civilian life. Thousands of veterans are diagnosed with post-traumatic stress disorder (PTSD). PTSD is a debilitating mental health disorder that is caused by traumatic events. Often, veterans who struggle with PTSD turn to alcohol and drugs to self-medicate. Two of the most significant issues facing our country’s brave veterans are substance use disorder and PTSD. When left untreated, the combination of these two disorders can be deadly. Unfortunately, there is a negative stigma surrounding both of these diseases. However, it’s time to end the negative perception and let our veterans know that it’s okay to ask for help. There are different substances that are abused for different reasons. 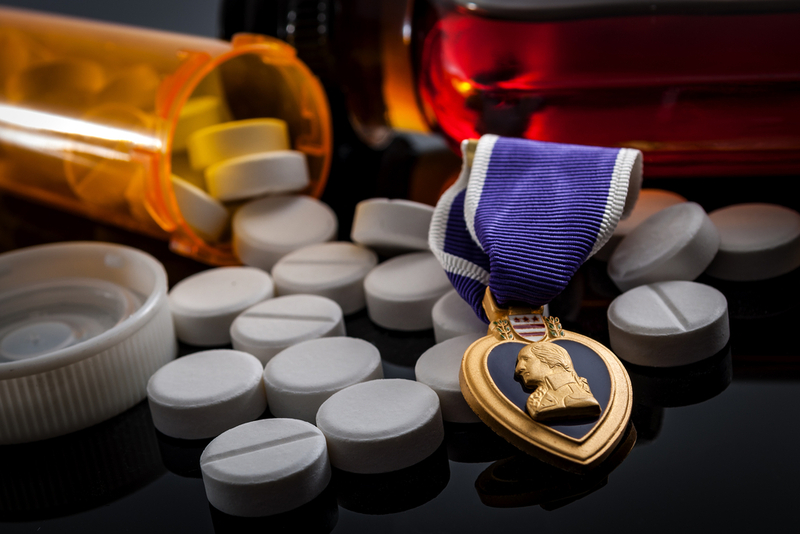 Veterans also may be prescribed medications such as painkillers, anti-anxiety medication or sedatives. What may begin as a legitimate prescription can quickly turn into an addiction, particularly with opioids like hydrocodone and oxycodone, benzodiazepines like Xanax and Valium and sedatives like Ambien. These drugs are all habit-forming and can create quite a problem. Alcohol is another substance that is frequently misused by veterans. It is the substance of choice for many veterans who are self-medicating as a way to cope with PTSD and other mental health disorders. If you or a loved one is a veteran struggling with drug and alcohol addiction, it’s imperative that you receive treatment as soon as possible. It’s essential that you find a national treatment center that specializes in the treatment of co-occurring disorders–co-existing mental health disorders like PTSD and substance use disorders. You may need inpatient treatment where you are on campus around the clock or you may be able to participate in a partial hospitalization program or outpatient treatment program. In a treatment program, you will undergo therapy (group and individual), courses and other healing activities to address the psychological, mental and emotional aspects of your substance use disorder. The Recovery Village Ridgefield offers inpatient and outpatient treatment programs for the treatment of drug and alcohol addiction. Our facility also offers treatment for those patients who have a dual diagnosis of a mental health disorder and a substance use disorder. Located close to Tacoma, Washington; Seattle, Washington; Portland, Oregon; Eugene, Oregon and Vancouver, Washington, The Recovery Village Ridgefield is an excellent choice for veterans seeking treatment for drug and alcohol addiction. Give us a call, and speak to one of our addiction specialists about how you can begin your recovery journey.